Back-to-school shopping is starting earlier every year—and it's increasingly starting on mobile. Here are the latest trends marketers need to know to be there and be useful for shoppers in their micro-moments. Back-to-school shopping is one of the year's top spending bonanzas, second only to the holidays. This year, the National Retail Federation predicts back-to-school shoppers will spend a total of $75.8 billion. With school supply lists in hand and the latest trends in mind, busy parents are turning to mobile during their I-want-to-buy moments. For retailers, this means giving shoppers ideas and information in their micro-moments—being there and being useful. 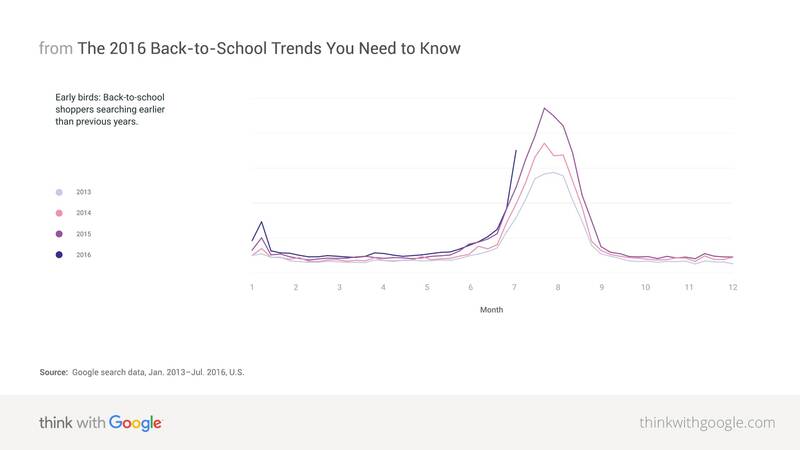 To help you stay on trend for back-to-school, we looked at how people are using Google Search and YouTube. Here's what we learned. Source: Google search data, Jan. 2013–Jul. 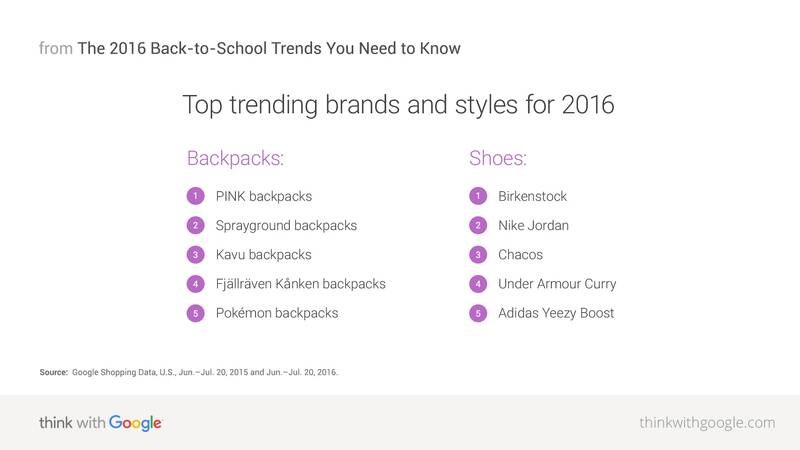 2016, U.S.
What brands are making back-to-school shopping lists this year? Let’s start with that back-to-school must-have: backpacks. In years past, Herschel was in. This year, the top five rising backpack trends reflect a wide array of new tastes, from bold to outdoorsy. Source: Google Shopping Data, U.S., Jun.–Jul. 20, 2015 and Jun.–Jul. 20, 2016. In addition to what products people are searching, retailers also want to consider where and how. For example, searches for “bookbag” are 3X higher this year compared to 2015.9 This regional term for backpack is especially popular in South Carolina, North Carolina, Georgia, and Delaware.10 These kinds of regional differences can shape how you market the same product in one area versus another. Prepare for the second wave. Perhaps preparing for classes after winter break, people also search for back-to-school in January. In fact, this second wave has grown stronger every year since 2013.15 Use the insights above to prepare for this second shopping wave—and it’s never too early to start thinking about back-to-school 2017. Think mobile. In this mobile-fueled shopping landscape, the retailers who can be there and be useful for shoppers will win. First, identify the moments that matter to your brand and then provide useful information, like product reviews, tutorials, or quick ways to purchase that are mobile-optimized. Go omni-channel. The latest data shows that mobile is connecting shoppers to brands and stores more than ever before. Make sure you’re connecting the dots between channels. Brands like Best Buy and Target are using mobile to draw customers into stores and seeing a large lift in store visits and sales as a result. Watch product trends and regional differences. Trends and tastes change faster than ever. Use Google Trends and our Shopping Insights tool to get the latest information on how and where consumers are searching. 1,2 Google Search data, U.S., Jul. 2015 and Jul. 2016. 3 Google data, U.S., aggregated, anonymized data from a sample of U.S. users that have turned on Location History, from Aug. 2014 and Aug. 2015. 4,5,9,10 Google Shopping data, U.S., Jun.–Jul. 20, 2015 and Jun.–Jul. 20, 2016. 6 Google Shopping data, U.S., Jun. 2014, Jun.–Jul. 20, 2015 and Jun.–Jul. 20, 2016. 7 Google Shopping data, U.S., Jun.–Jul. 20, 2015 and Jun.–Jul. 20, 2016. 8 Google Trends, U.S., Jul. 2015 and Jul. 2016. 11 Google Consumer Survey, U.S., among online adults aged 18+ who have done or plan to do any back-to-school shopping for their child(ren), n=1,007, Jul. 2016. 12 YouTube data, U.S., classification as a "back-to-school" video was based on public data such as headlines and tags, and may not account for every such video available on YouTube, Jun.–Jul. 2015 and Jun.–Jul. 2016. 13 YouTube data, U.S., classification as a "back-to-school DIY" video was based on public data such as headlines and tags, and may not account for every such video available on YouTube, Jun.–Jul. 2015 and Jun.–Jul. 2016; YouTube data, U.S., classification as a "dorm tour" video was based on public data such as headlines and tags, and may not account for every such video available on YouTube, Jun.–Jul. 2015 and Jun.–Jul. 2016. 14 YouTube data, U.S., classification as a "back-to-school DIY" video was based on public data such as headlines and tags, and may not account for every such video available on YouTube, Jun. and Jul. 2016. 15 Google Search data, U.S., Jan. 2013–Jul. 2016.